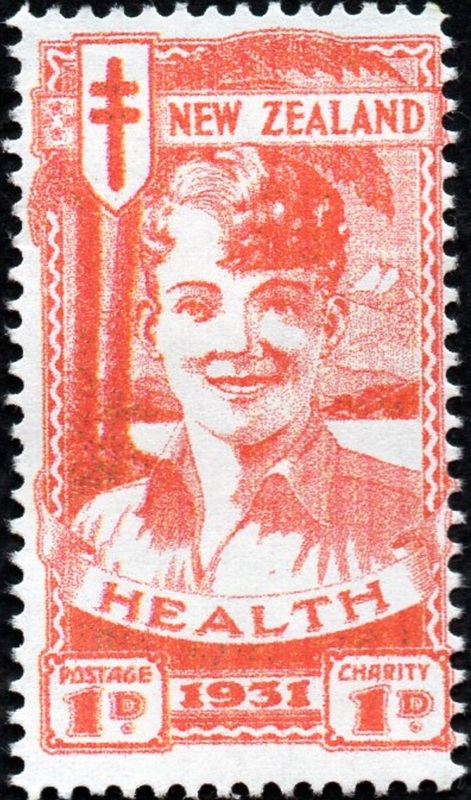 Virtual New Zealand Stamps: 1931 Health - Smiling Boys. Red Boy & Blue Boy. I'm not as experienced with collecting postage stamps having just recently started a collection on thematic New Zealand Farming stamps. 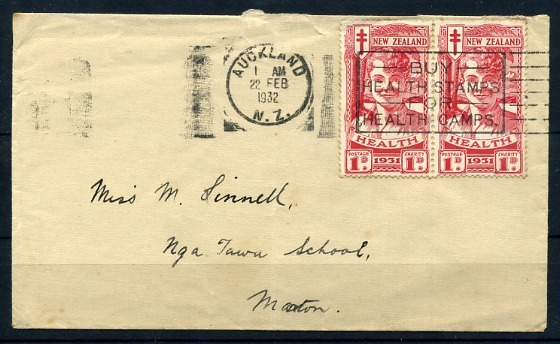 In fact, there is an early post in this blog where in the comments I refer to one of the rarest stamps of New Zealand as a scruffy bit of paper. LOL But things change, we learn and grow so now I write some of the easier posts here. I wanted to try something harder and so Allan suggested I try this one. 1931 Red Boy - 1d + 1d. 1931 Blue Boy - 2d + 1d. 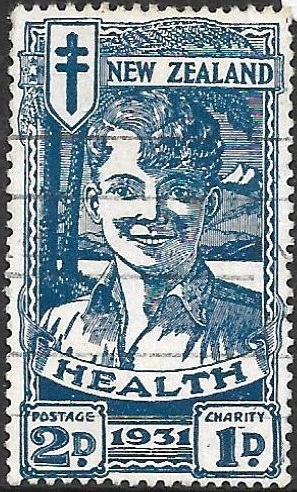 The 1931 red and blue smiling boys are perhaps the best known and certainly the rarest of all the health stamp issues. 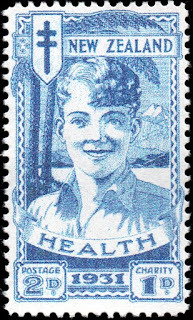 The two stamps became known as the "blue boy" and the "red boy." In 2017, fine mint examples of both these values are now worth $450.00, according to the Campbell Paterson Catalogue. 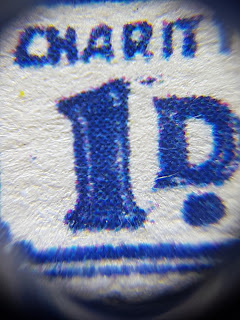 The 1d value was designed in England by the Royal Mint and was intended for the 1930 Health Issue but when it became clear that the design could not be prepared in time, it was held over for this, the 1931 Health Issue. 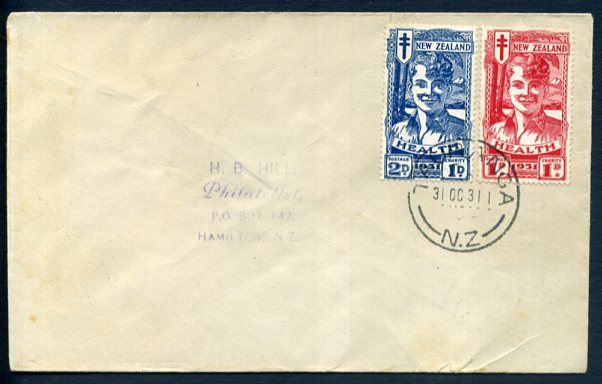 When the plates arrived in New Zealand it was discovered that the vertical spacing between stamps did not allow sufficient clearance for the comb perforation machine. The plates were cut and metal spacers were inserted but the end result was that these stamps were quite often poorly spaced. In June 1931 postal rates were doubled. Letters increased in postage from 1d to 2d, so the 2d design was added in New Zealand. 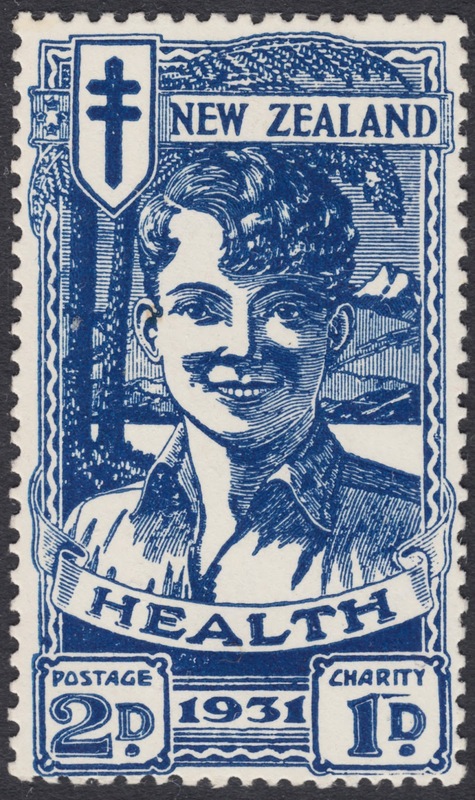 Since the early1930s was during the Great Depression, not as many were sold, 74,802 of the 1d and 111,929 of the 2d, which explains why good quality 'smiling boys' are now harder to find than any other health stamps from this same period, hence their higher value as mentioned above. The 1931 health stamp issue had 2 values, one in red and one in blue, both featuring the same smiling boy. The post office described him as "a happy, smiling boy radiating health and contentment." 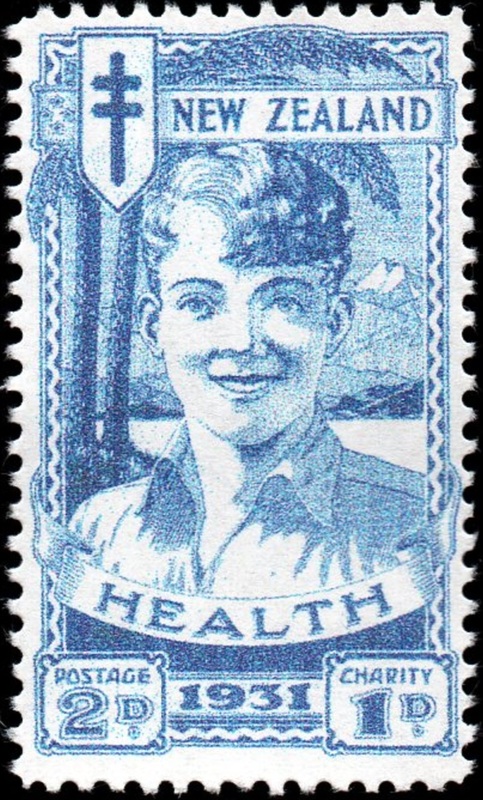 The stamps feature the boy with a New Zealand lake and mountain landscape in the background. The four stars of the Southern Cross constellation, which is rather hard to see, appears to the left of the Anti Tuberculosis cross. 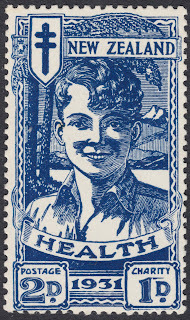 The fight to eradicate tuberculosis was the main reason the very first Health Stamp was issued in 1929. The two stamps are almost identical except for their values and some changes in the position of the 'D" in the value boxes. It is not often you see blocks of these stamps and here are matching blocks of four. First Day Cover - 31 October 1931. Our first cover is a First Day Cover for this pair. 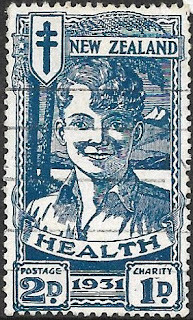 The early issues of Health Stamps didn't have printed First Day Covers so perhaps this should be called a "date of issue cover." This cover is dated 17 November 1931. Not the First Day Cover but still a good cover for these early issues. 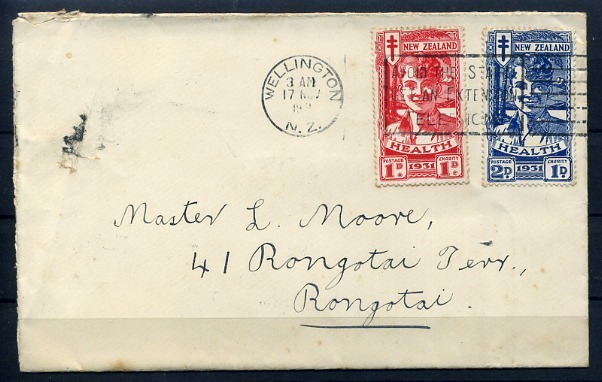 Our last cover was sent on 22 February 1932. I wasn't going to include it but Allan said it was a nice pair of Red Boys. The Accent Flaw above the charity 1d. The Accent Flaw more pronounced. The Accent Flaw is a blue mark like a line in the right-side "Charity" box above the letter "D." Mint and used examples are shown. I don't know how common this mark is but it appears that it may have changed during the printing process. This flaw, known as the "Accent Flaw" because of its position in relation to the "D" is believed to have been caused by a raised spacer in the printing plate that was touching the inking rollers and paper. In 2017, we have come across a number of forgeries of these stamps, some of which are almost impossible to tell from the originals when viewing online. Care needs to be taken when purchasing, particularly from trading websites such as E-bay or Trade-me. One warning sign should be when rare stamps such as these are offered at a really cheap price. These are supposed to have come from Dunedin and were printed off to promote and fundraise for a stamp exhibition. Our understanding is that they were never meant to deceive anyone but recently we've seen them being sold in online websites. They are usually seen as in strips of four imperforated as seen above. They look harmless enough but look what happens when they get placed on a cover as shown below. In this form, this forgery had an extra wide white border on their upper and lower edges. 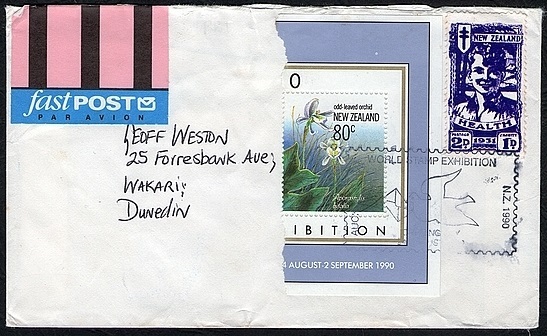 The cover was sent from the 1990 World Stamp Exhibition, held in Auckland. 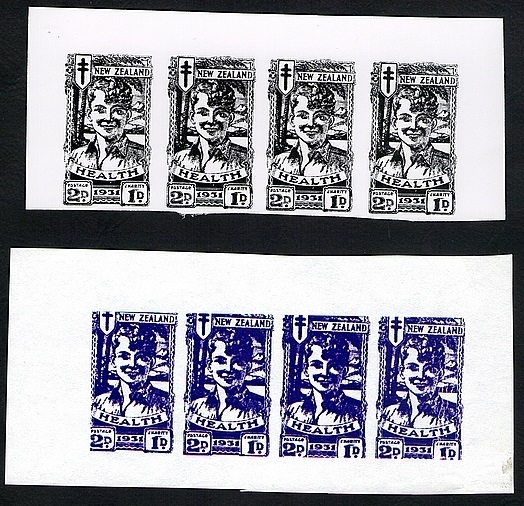 It shows one stamp of the special exhibition miniature sheet and the Blue Boy. 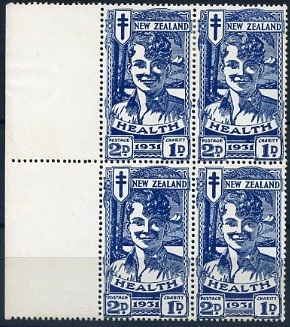 The Health Stamp, of course, would not have been excepted by NZ Post because of it sterling value. The cancel has been carefully placed so as not to cover the blue design but it appears to cover the Blue Boy's lower perforations. Allan said the more he looks at this cover, the more questions it raises. This example was shown to us by one of our readers. They were in an album along with some other very rare Australian and New Zealand Stamps. When we tracked down the seller from Hong Kong, he said they were fantasy stamps. Its all very well saying that but our reader from Europe, having little knowledge of New Zealand stamps got taken in, spending quite a lot of money for the small collection. The two extra values are interesting. They could be called "Fantasy Stamps," I suppose. Now, look at the enlargements below. See how the text is made up of small blue dots. This indicates that they were printed using a more modern printing method. Personally, I wouldn't have known that unless it had been pointed out to me. We do not know much these as the seller never responded to our questions. They were being sold as "very good private reprint" which again is fine if it goes into your private stamp collection as a space filler for a stamp you can't afford to buy, but they weren't, they were being sold online. If you enlarge these you will find that the sold areas are breaking down into white spots. 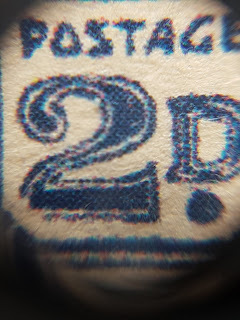 This is what gives these stamps their washed out appearance. 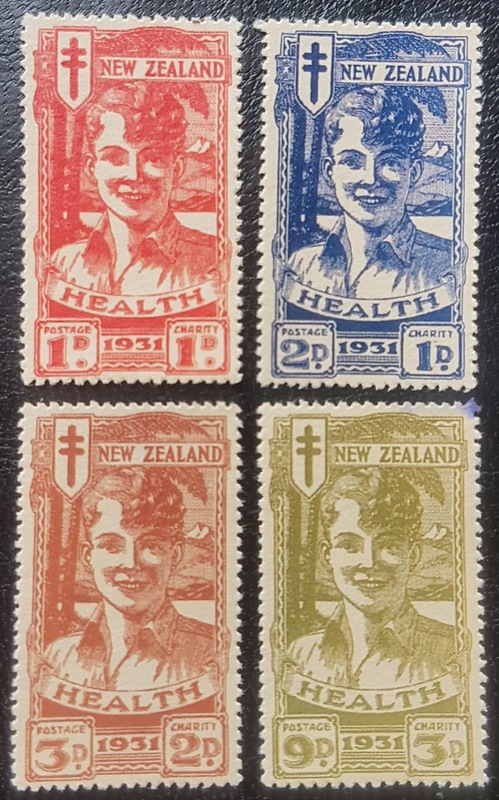 The original stamps have areas of sold colour with no white showing through. Both Allan & Mary have seen other examples. A cancelled one looked very convincing as the postal marks were carefully placed to hide any obvious mistakes. We are trying to get other examples and will include them in this blog. Of course, most of these forgeries will never stand up to an expert checking for correct paper, watermarks and perforation counts. Some things that are almost impossible to do when viewing online. Our final word on the subject is "Be Careful!" These stamps remained on sale until 29 February 1932. For a beginner stamp collector you did a good job Anne. An interesting page. A well written post. While it can be seen you were learning as you researched this page it takes nothing away from the end result. I was interested in the forgies too. It was good that you included warnings concerning the purchase of these earlier higher value stamps from online trading sites. Experts will use watermark, paper type and print quality to confirm them as being real. Buy off an image online, of course expert identification is impossible.